← Recovering, or, our weekend as told by the table. If DC could be represented by a meal, it would be brunch. Chicago is probably a nice dinner, New York might be a late night swanky cocktail or bagels and lox, and L.A. is probably sushi or something. But DC is most assuredly brunch. Brunch, the meal consumed by those who don’t need to do an honest day’s work on Saturday (so says James), the meal consumed by those who sleep till noon as a given on the weekends, and thus you can’t even think of breakfast. Brunch, the meal for a city where few people have kids that get them out of bed, houses that demand they get up and mow lawns, or commitments that force them to forfeit mimosas and overpriced waffles. In short, brunch is the meal of a decadent city wholly lacking in adult supervision (also from James). And man, do I love brunch. You get all the fun of eating out at half the price, and you get breakfast food — glorious piles of eggs and starches with the occasional punctuating fruit bowl or spinach leaf. You get to pretend like French toast with a side of potatoes is a balanced meal and sometimes you can justify bacon and milk shakes in the same sitting. Despite his exceedingly devoted midwestern work ethic, James loves brunch too. I’ve mentioned before how we like to stay in for brunch, making omelets and being lazy, but we also really love having brunch out. It doesn’t get to happen all the time, but when it does — oh man Saturday just got real. Because we live in Eastern Market, we have a plethora of brunches at our easy disposal. This map was floating around Facebook the other day and it is hilariously true, with one notable exception: over our neighborhood there should be a large and bolded BRUNCH. Though DC has no shortage of brunch spots, Eastern Market is a neighborhood practically designed around weekend brunching. You show up, put your name on a waiting list at whichever spot you want, and then wander through the farmer’s and flea markets until your time to stuff yourself with latkes and sausage. Plus, who wants to drive to brunch? You just want to wander out your door and find it raining pancakes. I will admit, I’m kind of brunch spoiled. Lexington had a surprising number of great brunch spots (Alfalfa, you taught me to love brunch and I will crave your breakfast burritos FOREVER) and so I didn’t really realize that lots of cities… don’t do brunch. GASP. There are two types of brunches: those where bacon and eggs are the standard fare, and those that drift more towards eggs benedict. I prefer the latter and James adores the former. Luckily, brunch inspires unprecedented happines and compromise. The nations of the world (or maybe just our own government) should seriously consider solving our differences over brunch. Anyway, should you find yourself in DC, you should get some Eastern Market brunch. Here are three of our favorite spots, all within a couple minutes walking distance of the metro and market. Ted’s Bulletin: You are probably sick of hearing me talk about it, but we really do love it. We love the diner vibe and the individual coffee pot you get (even if I still hate coffee). You do have to wait for an eternity, but you can wander the market and pregame with some macarons or a Ted’s homemade poptart. James’ pick: walk of shame breakfast burrito. Hannah’s pick: Ted’s Ultimate Breakfast Sammy (breakfast sandwich on TEXAS TOAST) or the French Toast platter. Boxcar Tavern: I love the long skinny railcar feel of this place, with the tiny booths and wood paneling. They also had pumpkin French toast for awhile that made me want to weep it was so good. James’ pick: southwestern omelet. Hannah’s pick: eggs benedict or the croque madame. Beuchert’s Saloon: As we learned in NYC, vintage bars serve wicked good brunch. James doesn’t like that they don’t do coffee refills, but I love that there are bottomless mimosas. Plus the beignet’s… BE STILL MY SOUL. James’ pick: the regular breakfast or the Breakfast Sammie. 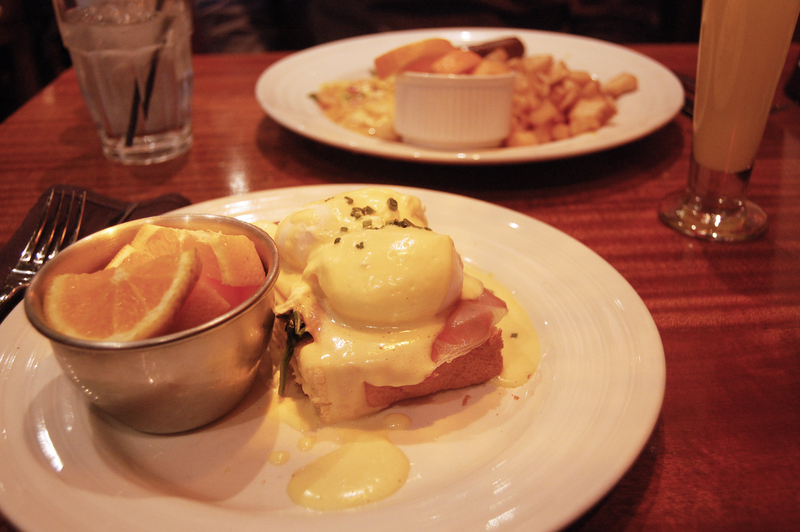 Hannah’s pick: Eggs of the Benedict. Any other brunch lovers out there? DC people — any other favorites? *Pictures 1,2 are from Beuchert’s, 3 from Boxcar and 4 from Ted’s. Boxcar is much better than that picture looks, but the lighting is rough for pics and I was so hungry I didn’t try very long. This entry was posted in Uncategorized and tagged brunch, DC, food, why i love dc. Bookmark the permalink. I love brunch. I haven’t tried all these places, but I will add them to my list. Love Teds but its always so crowded! This is so wonderful! Brunch is certainly the most wonderful (and most important) meal of a Saturday! Are there any really neat places to visit in DC (not touristy, of course)? I’ll be headed up there in a few weeks and needed to plan a fun visit! I was going to ask about the second picture — is that a beignet?! Not NEARLY enough powdered sugar. I’m with James on the limited coffee… but bottomless mimosas?! YES PLEASE. Mimosas are the perfect drink: morning, noon, and night! Ok, so I too was a skeptic when I saw that lack of sugar. But it is crunchy and delicious (more like one of those elephant ears from the fair) and perfect with the tart blackberry jam! My sister and I have gone to brunch at Poste and really liked it. It’s spendy, but it’s so good! She took advantage of their bloody mary bar, and the donuts are YUM. I just spent wayyyyy too long drooling over their website — I want to go!!! James’ might take some convincing that fancy brunch is worth it, but I feel up to the challenge. Oh brunch… if I could eat one meal for the rest of my life, that would be it. 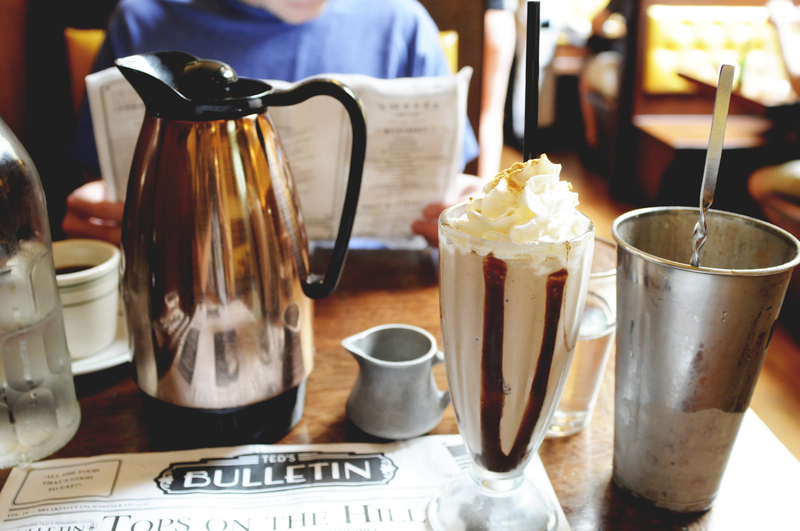 I haven’t been to Ted’s Bulletin but definitely want to try it next time I’m up there visiting my parents! I am in FULL agreement! Because brunch lets you eat everything!!!! I hope you make it to Ted’s! I spent a summer living in DC for an Internship and I’m a little disappointed now to have never tried any of the brunch spots you recommended here! I did venture out for the beloved meal a handful of times, but I usually ended up at spots in Adams Morgan. The next time I return to the city, I’ll be looking for these picks!